...it's always tea-time...: TRAVELLING BAG FOR PETS. Little girls who like to carry their pets with them on a journey will be glad to know how to make this pretty and convenient bag, by means of which Fido and Mutt can travel like princes. The bag is made of black leather, and is closed on the side with a lock and key and clamps. The pocket for holding the dog is fifteen inches wide and nine inches and a half high. The front is cut out, leaving a margin on the edges an inch and a half wide, and the opening is filled with a wire screen, through which the little prisoner can see and breathe freely. 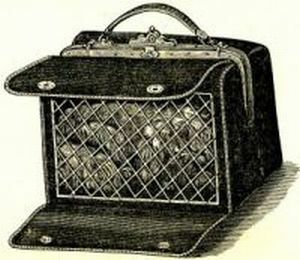 For protection, the screen is covered by two leather flaps, fastened one at the bottom and one at the top of the bag, which overlap each other, and are secured by steel clasps. Not much of an instruction! En del smådjur sitter nog hellre i en väska, än att bli lämnade ensamma. Förmodligen beror det på om det blivit vana vid det se'n de var unga. Jag har sett småhundar hoppa ned i sina väskor själva. Åskar går in i sin bur om den står framme, men gillar nog inte att bli transporterad - fast det kanske bara är principklagande av en frihetsälkande katt.